I truly believe it is just as important to invest in a great pair of sports headphones as it is to invest in a great pair of running shoes. Many workout in headphones that are not meant for sports, cannot handle sweat causing shorting out and ear devices that are too big or too small for your ears, causing headaches. I have had issues with my ears before I took my first step and headphones have always given me headaches. When we first started running, I couldn't listen to music for more than 2 miles without my ears pounding from the pressure. I got my first pair of Koss headphones shortly thereafter. 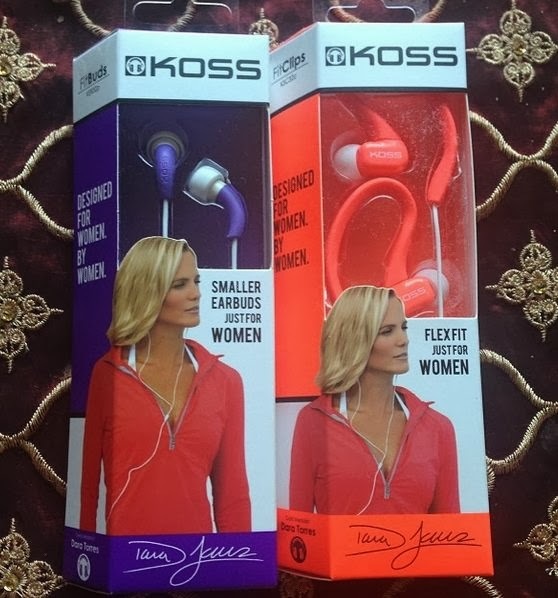 Koss went a step further had had their female designers team-up with Gold Medalist and Florida Gator Dara Torres to create the world’s first headphones designed specifically for women, by women. I was very excited to hear this news and try out their new FitBuds which are 33% smaller than any other earbud Koss has created, only six millimeters in diameter! For those with really small ears like myself, Koss included 3 different size ear cushions to make sure you had a perfect fit. Plus these EarBuds are sweat resistant. As I expected, I needed the smallest of the three sizes of cushions to fit snugly into my ear. They were very comfortable, I did not realize they were there and no headaches to report! Koss has another product out that is unique to women - the Koss FitClips. The FitClips have three sizes of ear cushions, just like the EarBuds. The flexible clips around the ears are soft and do not press into your head. The thing I love about FitClips is that they will not fall out so you never have to worry about positioning your buds due to them slipping out of place. Koss has a Holiday Sale going on right now, offering the FitClips and EarBuds for only $19.99 which is a steal! You can find them at Wal-Mart, Best Buy, Walgreens, Kmart and Sears. Since I am in a giving mood, I want to give away the pair of Koss FitClips shown above to a lucky reader! Do not worry, they are still new in box. I got to check out the FitClips first hand thanks to a friend who owns a pair. Since I am craving chocolate, which never ever happens, leave a comment below letting me know what your favorite Christmas cookie is! Make sure log your entires through the rafflecopter widget below and come back each day for more chances to win! I gotta go with the classic sugar cookies! My mom would make them every single year in the shape of Christmas Tree's and we'd make homemade frosting to put on and get to "decorate the tree" ;) It was so much fun and they are so delicious! Why can't cookies be good for you?!?! My best friend's chocolate crinkle cookies!! The peanut butter kiss cookies!! My favorite Christmas cookie is gingerbread; the more spice, the better. I would have to say snowball cookies are my favorite! They taste especially wonderful if you eat them straight out of the freezer! my favorite cookies are any that I bake with my kids!!! Especially oatmeal raisin though! Sugar Cookes shaped like snowflakes! I'm always a white macadmia nut or oatmeal raisin girl regardless of the time of year. These would make a great gift! Great blog!